A lectern at the front of the room lets everyone know where to direct their attention. 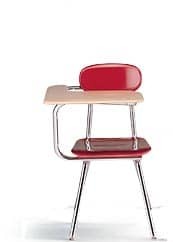 Whether you’re teaching in front of a classroom or addressing a large audience, speaking from a podium helps keep you focused with a surface for your notes and a ledge to keep them from falling. A must have for the Debate Team, stand-up and tabletop lecterns boost confidence and command respect.